When you’re looking for a salad with some serious crunch, look no further than this Chinese Chicken Salad served by the good folks at La Bou Bakery & Café in Auburn. This is one of my go-to places on days when I either forget to pack a lunch or have nothing absolutely in the fridge to bring to work, which was the case Monday following a weekend out of town. 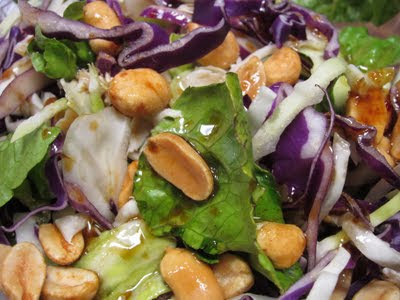 This salad features chicken, lettuce, cabbage, peanuts and soy sesame vinaigrette.